Embezzlement is a type of financial theft. Embezzlement is a term usually used for the fraud or theft made by a trusted employee in a business. An embezzlement is generally a continuous act of stealing small amounts from the company’s finances to fund personal expenses. In case of embezzlement, the employer can bring a legal case to court against the employee.The penalties depend upon the amount of theft. After a court case, if found guilty, the embezzler may be required to pay back the money or may be fined. Some of the cases may cause a prison sentence. Accounting embezzlement is the manipulation of bookkeeping records to hide the theft of assets. Assets can be both funds or property. A bookkeeper who takes customer’s refunds and keeps them as their own is an example of embezzlement. Embezzlement impacts the finances of your business in the long run. A fox in a financial hen house is metaphorically speaking for those trusted to manage bookkeeping work who ultimately misuse their position. They manipulate figures in accounting to make frequent thefts. Focus on two factors to prevent embezzlement in your business bookkeeping. If you have an electronic system or your accounting statements are done manually on a register, the financial statements should match with the cash flow statements and balance sheet. In manual bookkeeping, there is a chance of honest error, but keep an eye on any difference in the numbers on your accounting statements. If one of your employees starts spending more than others, keep a close look on their activities in your business functions. They might be involved in some kind of fraudulent practice. A fixed pay usually does not leave room for spending extra than actual needs. If there are numerous transactions to clear errors, it might be done in an attempt to hide fraud or theft. If there is more than one payment for a single bill, it again might be the case of fraud. Keep a very watchful eye on the bookkeeping in your business. If an employee is working hard in a company and is not leaving work for others, a check on their activities must be kept. They might be involved in fraudulent practices. If an employee has a routine of unusual working hours, they might also be involved in some kind of fraud in your business bookkeeping. Specifically, if they are frequently coming in early, leaving late, and doing overtime without a demand for extra payment, these are signs of some kind of suspicious interest in your business. 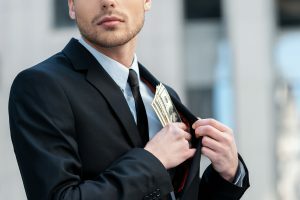 There are various motives to commit embezzlement for an employee. Most embezzlers, when interviewed, said the reason behind embezzlement was to take revenge for mistreatment they had received at the company. For example, if an employee had worked very hard to get a raise but was denied, they can develop ill feelings towards the owner and the company. This is, unfortunately, a common practice of employers to make their employees work longer hours without many benefits. Working long hours often result in an increased profit margin but, often, the employees are not given incentives. This is the most common cause of embezzlement. The employees try to get the business back or they want to hit the employer where it hurts the most. Of course, financial loss, though small, hurts the employer and their company. There are reported cases where an employee makes frequent thefts from a company’s funding to support a lavish lifestyle. Addiction is the root cause of so many physical ailments as well as unethical practices. Those employees who are passing through an emotional stress or trauma must be given emotional support. A few fall victim to drugs. A paycheck is not enough to support their addiction and, often times, they find the only way out is to steal from their employer. To prevent embezzlement, you must focus on cash transactions and the person in the fiduciary position. In addition, be aware of the warning signs of theft in your company. You must be aware of unusual practices going on in your office. Besides these precautions, build a good relationship with your employees. This will ensure a trust between you and those that work for you. https://www.completecontroller.com/wp-content/uploads/cclogo_main-long-300x63.png 0 0 Complete Controller https://www.completecontroller.com/wp-content/uploads/cclogo_main-long-300x63.png Complete Controller2018-05-18 17:34:532018-05-18 22:00:50Embezzlement: Is There a Fox in Your Financial Hen House?